I've recently read the book Why We Sleep by Matthew Walker. It covers many aspects of why sleep is very important for our health and factors related to its quality. Reduced amount of sleep can significantly degrade health, memory, productivity, athletic performance and quality of life. Exposure to light and specifically to blue spectrum of the light before the sleep is reducing amount of sleep hormone (melatonin) and making harder to fell asleep and as result can reduce time we have for sleep. I wanted to start measuring my exposure to blue light over the day. Over holiday season I had some extra time, so I decided to build a wearable device that can log sensor data, monitor blue light exposure and alert me if its level too high and potentially can prevent normal sleep, especially at time close to sleep. I'd like to share my journey in this blog post. I hope you find this helpful. I've published my idea at element14 Wearable Tech contest page. Shortly I've received a nice holiday card from element14 team, PocketBeagle, element14 t-shirt and other goodies. I've done a mobile robot project in the past on BeagleBone Black (BBB) as part of Control of Mobile Robots course by Georgia Tech and Coursera. It was quite a challenging, but at the same time rewarding experience So I was hopping to leverage some Python and BeagleBone skills I've developed at that time. PocketBeagle is much smaller (35mm x 56mm x 5mm) then BBB (55mm x 86mm) so it is more portable and wearable. PocketBeagle doesn't have eMMC so it needs a microSD card to support OS. The recommended OS is Debian and its latest release image can fit on 4GB card. PocketBeagle comes with USB mini port, but it doesn't have expansion headers, and DC plug. I realized that it requires some soldering to connect sensor and battery. There are a lot of projects and code samples available for BBB. Most of them can be used with PocketBeagle. But PocketBeagle has a bit different pin-out compare to BBB. So some adjustments of code and connectivity is required. The PocketBeagle documentation is quite good and easy to follow. So I was able to setup SD card and start using provided web examples quite fast. to get root authorities. The root user has the same default password - temppwd . One of his points is the effect of the blue light on sleep. 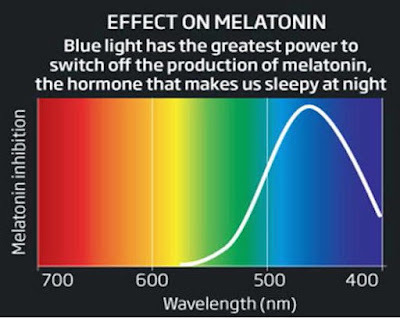 Melatonin helps trigger sleep in humans..Blue light has a very strong on melatonin inhibition. I was looking for something to embed light sensor, so it can be wearable, but not too big and not look super nerdy like Google Glass. Pen seems to be a good option.It can host a photoresistor and a LED indicator.USB battery is quite big compare to everything else. So it is a good candidate to be replaced with something smaller. Assembled sensor with LED inside a pen. Assembled sensor - view from top with blue light filter. Assembled PocketBeagle Board view from the top. Assembled PocketBeagle Board view from the bottom. There is less light in horizontal position of the sensor. As result LED is off. When I turn it into vertical position, there is more light (including blue light) and LED gets switched on. I've a NXP Rapid IoT node. It has several sensors including light sensor, During the test I've set both devices next to a light source (Varilux Comfort Lens VT15 - CFML36VLX - 2500 lumen) using my soldering station and applied the same blue filter for both of them. I've oriented NXP device to represent a head and my wearable sensor simulated position in the front pocket. CFML36VLX lamp light is evenly distributed according to its manufacturer. So blue light is taking ~1/3 of visible light spectrum. Please note, that you need to have an elevated permissions on PocketBeagle to run this code thanks to GPIO setup call.. It is a small fun project to have a better sleep. There is a lot of room for improvements - make it smaller, replace static with dynamic alerts depending on how much time left before sleep, more precise calibration of sensor, automated data upload when network connection is available. PocketBeagle is a very tiny, but impressive Linux board.I still like to explore a lot of its capabilities, like PRU, power management. I wish PocketBeagle came with soldered extension headers and a battery. I hope PocketBeagle in the future will have some king of wireless network connectivity like BLE.